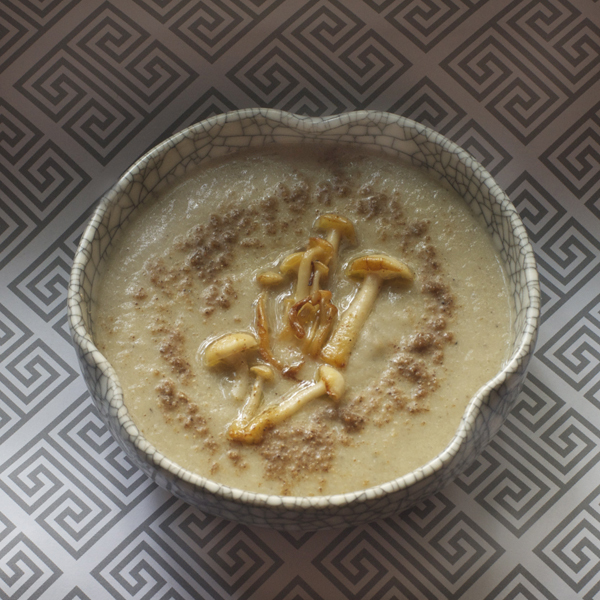 When life hands you mushrooms, make mushroom soup. I found myself with 2 bags of mushrooms leftover from my D’Artagnan shoot so I made something I’ve been wanting to make since I swooned for his mushroom ketchup –– Heston Blementhal’s mushroom soup –– but my Creative Crew challenge this month was 1 vegetable/fruit done 3 ways, so I knew I had to visit Jane Grigson’s magnificent mushroom book, The Mushroom Feast for inspiration for the other 2 dishes. Jane Grigson knows mushrooms. I imagine most of you in the States are unfamiliar with Grigson, and that’s too bad. 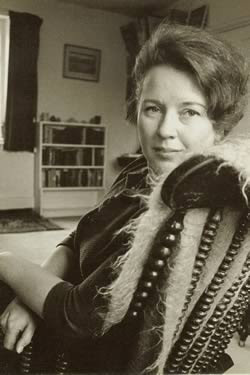 She was a wonderful British writer and food historian who died unexpectedly in 1990 at 62. 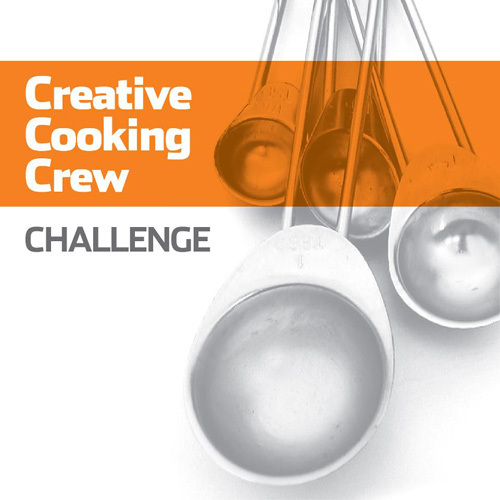 The Oxford Symposium on Food and Cookery hosts the Jane Grigson Trust Lecture every year. The International Association of Culinary Professionals gives out a Jane Grigson award every year for food scholarship and writing. 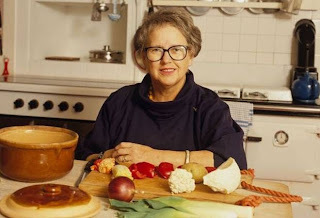 She is so honored because she looked at the process of food writing in her own way, inspired and promoted by another great English food writer, Elizabeth David. 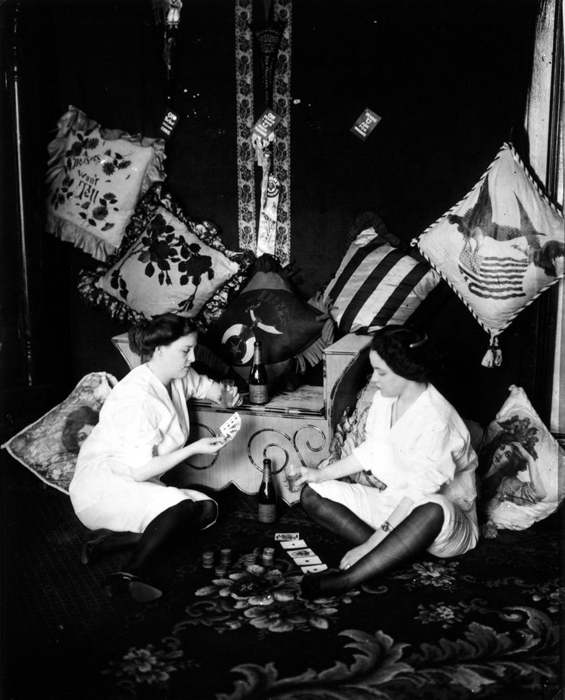 What was unique about Grigson was the way she told stories about food and history and places. She did it in an entertaining way full of delicious facts and anecdotes. She connected food with fascinating people. 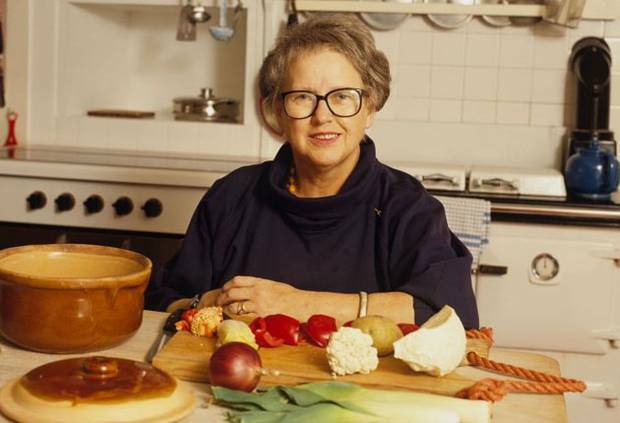 She humanized food writing and drew parallels between producers, cooks, consumers and food –– she was an early advocate of good quality products AND her recipes are really spectacularly good. Her book on mushrooms and my recent discovery, Food With the Famous, are favorites in my collection. 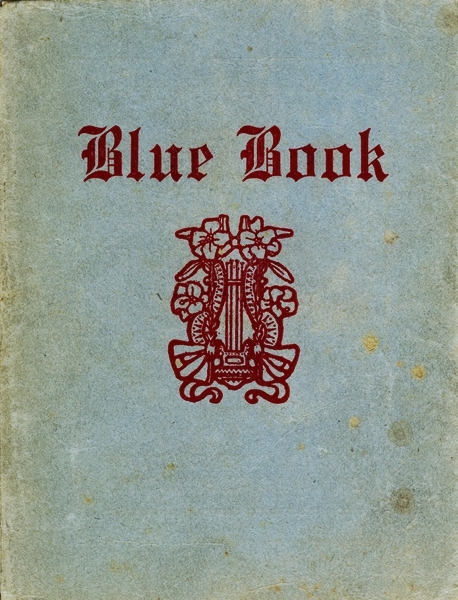 She came to cookery writing because of a lucky tangle of circumstances –– dashed hopes, love, and a Siren’s song of beautiful French food that struck a cord in a soul all too familiar with British war-time food rationing and unappetizing food choices (rationing didn’t end in Britain till 1954). Immediately after Cambridge in 1949, she went off to Florence to learn Italian properly. This held her in good stead after her job at an art gallery and attempts to secure her dream of a post at the V&A washed out. She went into translating Italian, and then publishing –– ending up with a personal hero as a boss when she began working with editor and poet Geoffrey Grigson as a picture researcher on People, Places Things and Ideas in 1953. Things went so well they got married and moved into his 17th century house in Broad Town, Wiltshire, England. Poetry writing, editing and publishing fine books have rarely been lucrative pursuits, so Jane had to do some translating to make ends meet (she won a prestigious award for a 1966 translation). Jane acknowledged, living with a poet influenced her style immeasurably, "Geoffrey taught me everything," she says. "I spent 26 years two steps behind him." He was a great teacher –– her writing is a thing of beauty. 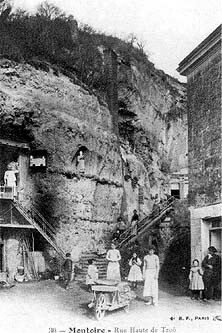 early photo of the house below - see the statue in the wall! When their daughter Sophie arrived the stars aligned for them to decamp to foreign shores for a getaway. Knowing Geoffrey Grigson’s love of France’s painted caves, a friend told them about a troglodyte village of cave houses in Trôo, France. They loved the place so much they wanted to live there. Fortunately, they were dirt-cheap to buy –– perfect for struggling writers with a new baby. 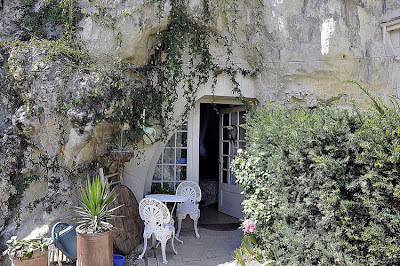 After a 20th century upgrade, they had a magical country place and Jane took to the bounty of beautiful French food like a fish leaving a bowl for an ocean. Oh brave new world! After her first book on chracuterie was a hit, she became the food columnist for The Observer in 1968 and remained there until her death. A 1983 People Magazine article told the "Trôo" story: "After their daughter, Sophie, was born in 1959, they wanted a vacation house in a sunny climate. 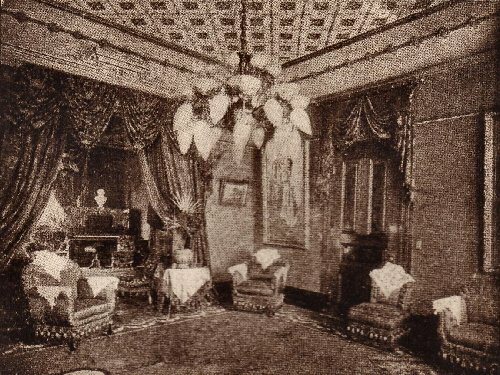 Jane's father had given her $1,300, and they used it to buy the three-and-a-half-room primitive grotto, which dates to the 1850s. They tiled the floors, whitewashed the walls and installed electricity and plumbing. "It's been sort of a 20-year hobby," says Jane. "We've always regarded it as posh camping." There are no photos that I could find of the Grigson place, but I found these on a wonderful site by Yves Vinay HERE to give you an idea of cave living in Trôo. 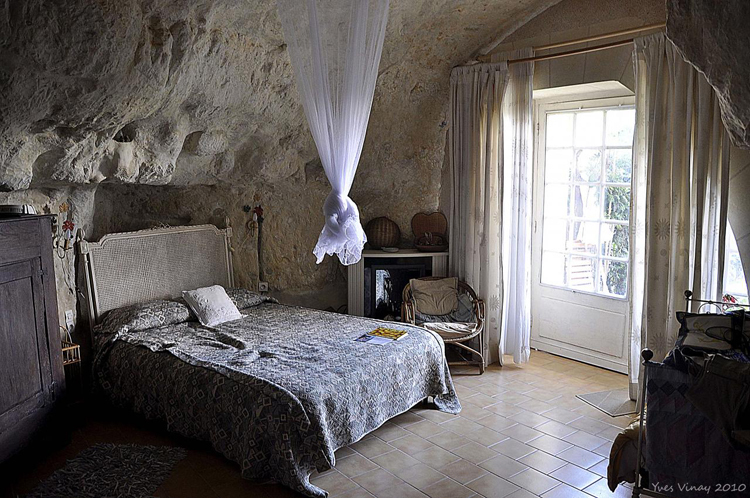 Ah, cave houses in Trôo! 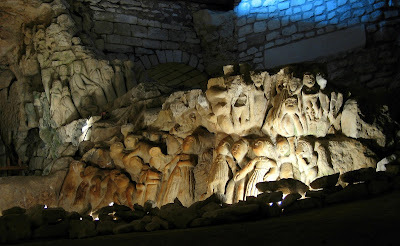 I am mad for caves and cave art (I wrote a bit about it HERE). This troglodyte village, carved into the cliffs is magic (you can see a fun video of a cave dweller HERE ). La Cave aux Sculptures, 16th c. carvings of 400 souls, Deneze-sous-Doue - don't they look like mushrooms? I love the area and the idea of my own carved-out room (there are troglodyte B&B’s you can stay in, like the one in Vouvray to try out cave living). 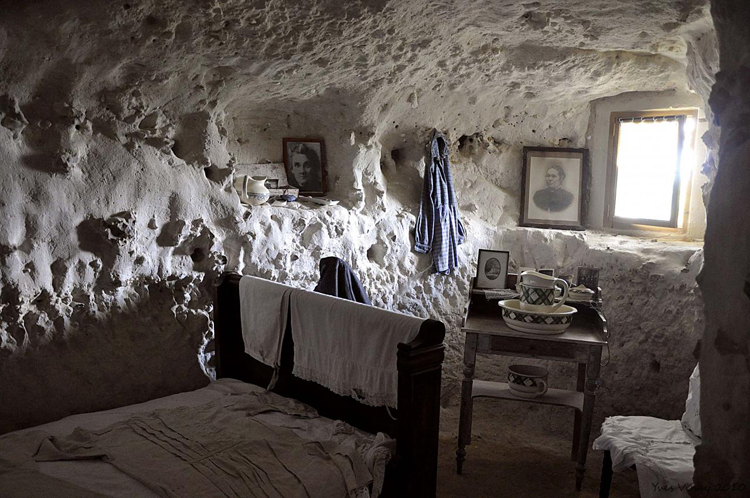 They were used for storing wine, making art –– like La Cave aux Sculptures, and for housing – poor farmers took refuge in them since they maintain a fairly even temperature in all seasons. A bit of a fire can warm them on the coldest days. They are also used for growing mushrooms. 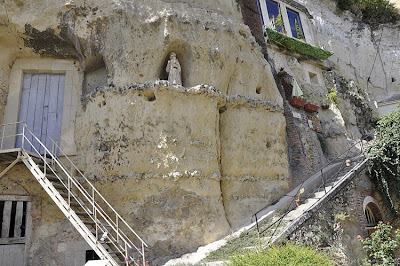 Here’s where the mushrooms, Grigson and troglodyte living all coalesce –– Mushrooms and caves have always been fast friends (there’s even a Mushroom Museum set in a cave in the area). 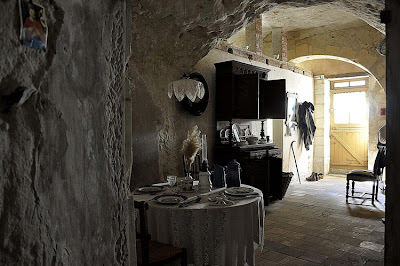 The proximity to those caves and the woodland groves of mushrooms in the area inspired Grigson to write her The Mushroom Feast as the area’s charcuterie had inspired her first book, Charcuterie and French Pork Cookery, the book that started it all. 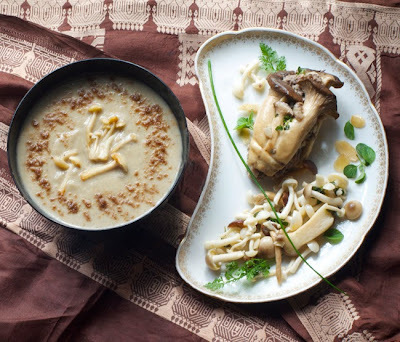 To satsify your mushroom addiction, please enjoy Heston Blumenthal’s mushroom soup (with a jolt of dried mushroom powder to supercharge the flavor) and Jane Grigson’s sausage, cognac and demi-glace stuffed mushrooms (that I've deconstructed) with light lemony mushroom salad. It’s a vegetarian feast of mushrooms. I’m imagining a troglodyte mushroom picnic with a cave-cold Vouvray right now. Melt the butter in a large pan, preferably deep and wide. Add the onions and potatoes and cook, covered, to soften but not brown. Add the leeks and mushrooms. cover, cook to soften. Turn up the heat and add the vermouth. Cook, uncovered, until liquid nearly evaporated. Add the stock and cream and cook 10 minutes. This is a lot of soup. I took out the solids and gave them a whirl in the processor first. Then I put them in the blender, 1/3 at a time with some of the liquid and pureed them. I didn’t put them through a strainer but you could do if you want it super finely textured. At this point, add the milk and demiglace if you are using it and salt and pepper to taste. Heat oven to 300º. Toast the mushrooms for 5 minutes and cool. Put in spice grinder and pulverize. Sift the powder. You can re-grind any thick bits and sift them in. You will have a good deal left over, great to use sprinkled in soups and stews for umami. Saute vegetables, onions for 10 minutes, add the rest and cook for 10 minutes more. Add liquid and herbs and onion skin. Strain stock, pressing gently on solids. Add salt and pepper to taste. You should have 5 cups. Combine the sausage with ¼ c of the almonds, chopped, about 2 mushrooms chopped or stems if you are using caps (around ¼ c) and the liquids and herbs. Moisten your hands with butter or oil and rub the mushrooms. Slice the mushrooms in half lengthwise and insert the sausage like a sandwich or, if you are using caps, stuff the caps with the mixture. Place in the buttered oven-proof pan. Sprinkle with remaining sliced almonds if you are using caps. 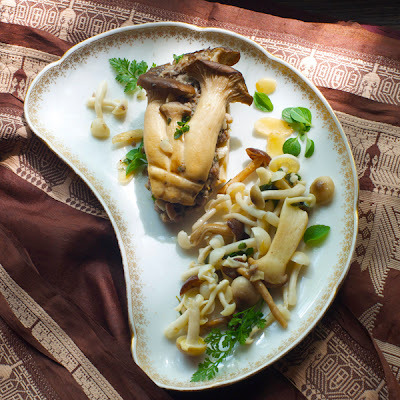 Cook for 10 minutes, then gently flip if you are using the long mushrooms and sprinkle with remaining sliced almonds. Cook for another 10 to 20 minutes. Check to see that the pan doesn’t scorch. You can add a splash of white wine if it seems dry. 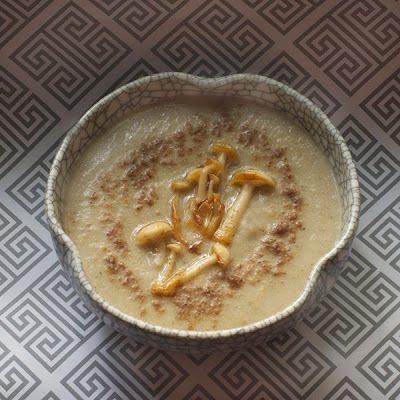 Combine the mushrooms with lemon and let sit for an hour. You can blend the oil and herbs if you would like or just chop them and add to the oil. Salt and pepper to taste. This is my 200th post! Whoever thought I would still be writing this blog and enjoying it. I am and I do. It’s hard to believe it was 35 years ago. Susan Sarandon still looks great, Brooke Shields is beautiful and has kids older than she was in Pretty Baby. In the 1970's, New Orleans was in the air in films, art, fashion and even food. New York’s art scene swooned over E.J. Bellocq’s Storyville photographs of ladies of the night at MOMA. 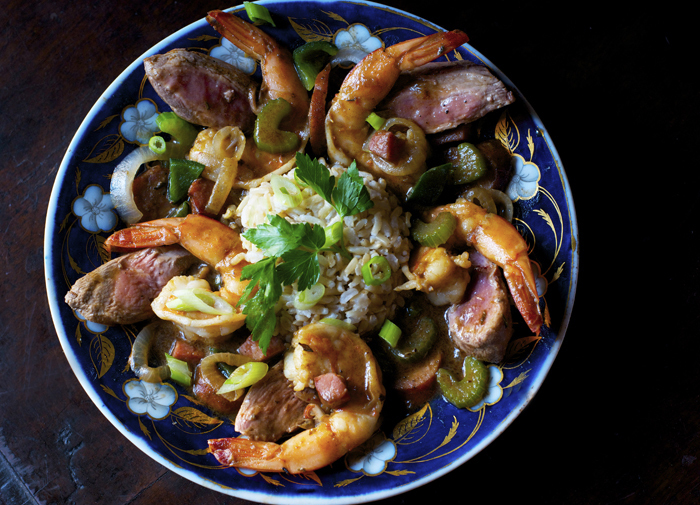 In New Orleans, Paul Prudhomme was cooking up a storm at Commander’s Palace and then his own KPauls and his recipes started appearing everywhere. In NYC we were “blackening” everything in sight and buying gauzy chemises like mad. The time was ripe for an old New Orleans/Storyville film but Louis Malle's Pretty Baby shocked sophisticated urban audiences when it came out in 1978 because of the character of Violet. As with Jodie Foster in Taxi Driver, people were horrified by 12-year old Brooke Shields role in the film. 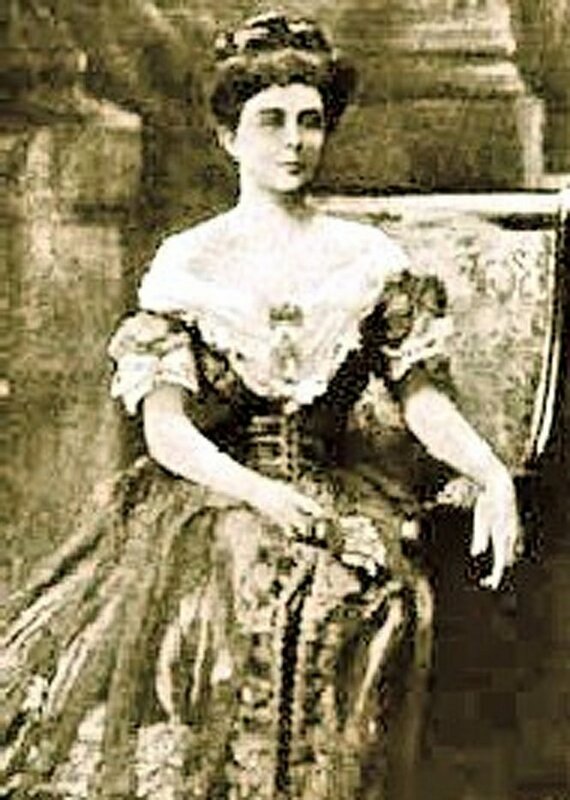 Not only was her character living in a “sporting establishment”, she was served on a silver tray at a gentlemen’s virgin auction –– a shocking environment for a child even if it was less sordid than the reality of a 1917 New Orleans brothel. 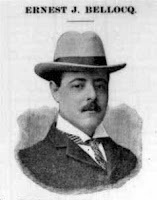 The film was a sensation. Pretty Baby's visual milieu was rooted in E.J. 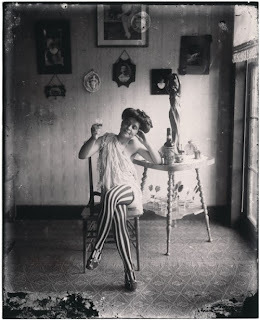 Bellocq’s eloquent photographs of the demimondaine of New Orlean’s Storyville –– a red light district set up to contain misbehavior in a few blocks around Basin Street in 1897 (by a NOLA alderman named Sidney Story). 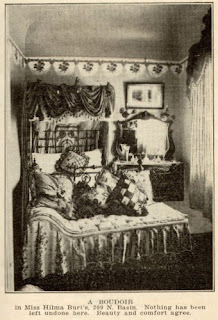 Keith Carradine played Bellocq in the film. The quality of the pleasure houses went from squalid to elegant. At the height of Storyville, 4000 women within the area were priced anywhere from 50¢ to $10 (although individual celebrities could go for considerably more). 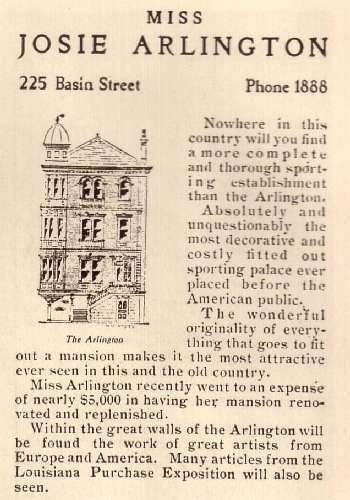 Arlington House, which was one of the posher places, boasted that it was a $5 house. 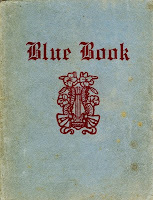 As in Paris and New York, a New Orleans Blue Book was published that let patrons know the services and women available at each “house”. After its 20 year run of graft, prostitution and drug and alcohol abuse, Storyville was closed by WWI. US military brass shut it down after a murder or 2 of some of their enlisted men. They decided it was not a suitable environment for troops on their way to the European front. Nearly all the buildings (including the beautiful mansions) were torn down during the Depression to build grim housing blocks called The Iberville Projects. 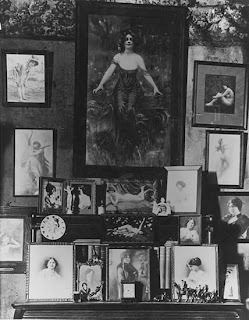 The women live on through Bellocq's work, posing forever –– connecting with those who see them with ancient eyes that have seen too much. 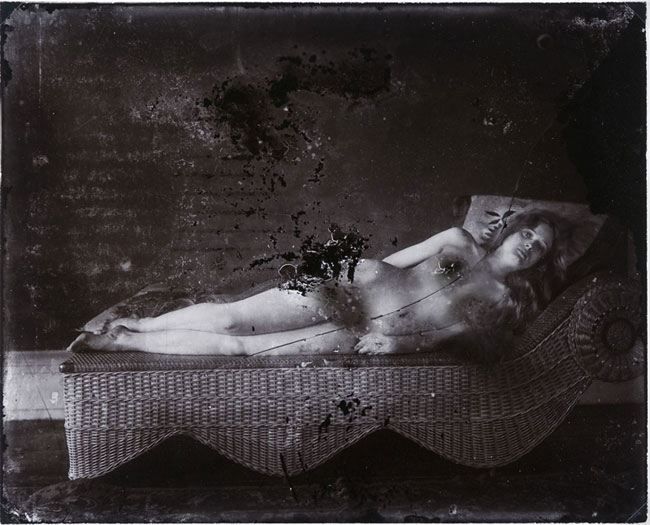 My favorite photograph might offend since it is full-frontal (you can click HERE to see it without my polite retouching) but the model is terribly beautiful and the photograph just sensational with all it’s damaged bits –– actually, that adds to its haunting quality (you can see more of Bellocq's photos HERE). 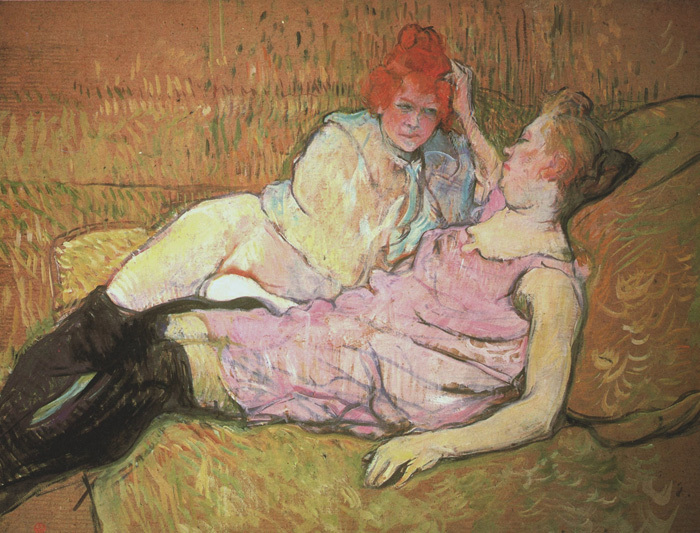 As in the film, Bellocq gained the confidence of the girls, much as Toulouse Lautrec had done in his time with the working-women of Paris (I wrote about that HERE). Neither man judged or objectified his subjects so there seemed to be an open dialogue between them. I started thinking about New Orleans spicy past last week when I helped out on a D’Artagnan shoot and found myself the lucky recipient of Andouille, tasso ham, duck breast and duck fat. 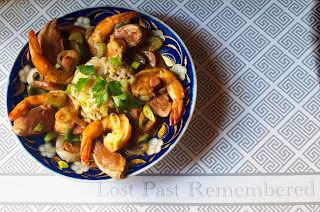 I couldn’t think of a better use for them than to make my own version of New Orleans Gumbo (sans okra). Something about gumbo and the earthy quality of the ladies of Storyville went together in my mind –– like the legend of garlicky, pasta puttanesca goodness wafting from ladies of the evening’s rooms, enticing patrons in Italian port cities. 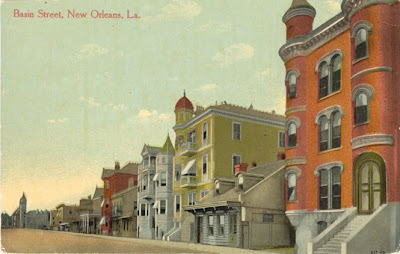 Storyville was probably scented with gumbo pots burbling away in many a bordello kitchen. It does have a marvelous dusky odor -– a gorgeous dark caramel-colored, roux-thickened sauce brings all the parts together. 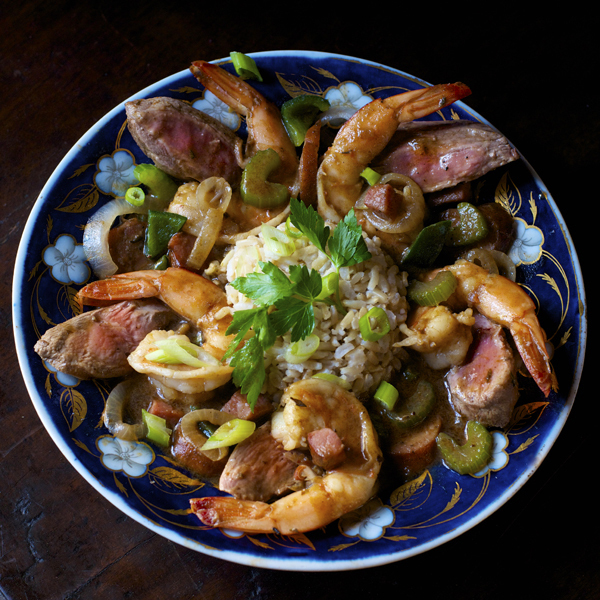 Since I had beautiful duck breast, I decided to just barely cook the duck meat with the shrimp at the last minute so the duck would be juicy and rare and the shrimp pillowy –– provocative textures to compliment the earthy flavors. 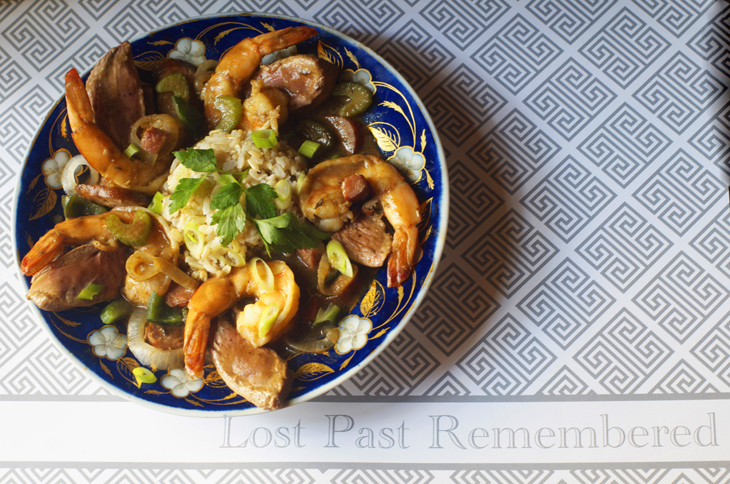 My own first effort at gumbo in the 80’s was nearly a disaster. Who knew that simmering fish stock over night would turn my lovely Village apartment into a Superfund-site of dead fish smells? Borrowed fans and a bit of luck saved the special birthday evening and my gumbo was insanely good – the fish stock was perfect when mixed with all the rest and I didn’t burn the roux (it is a bit dangerous if you go to full dark). Here’s a fairly easy recipe for it. 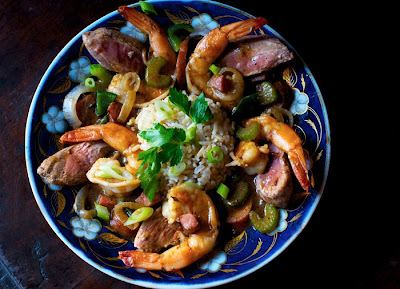 You could even make the base earlier in the day or the day before and reheat it with the duck and shrimp minutes before serving (I like it better the next day). I served it with brown rice but it's also delicious with grits. Heat the duck fat in a skillet and add the flour after it is hot. At medium heat, stir for about 5 minutes until the flour is a light caramel color. 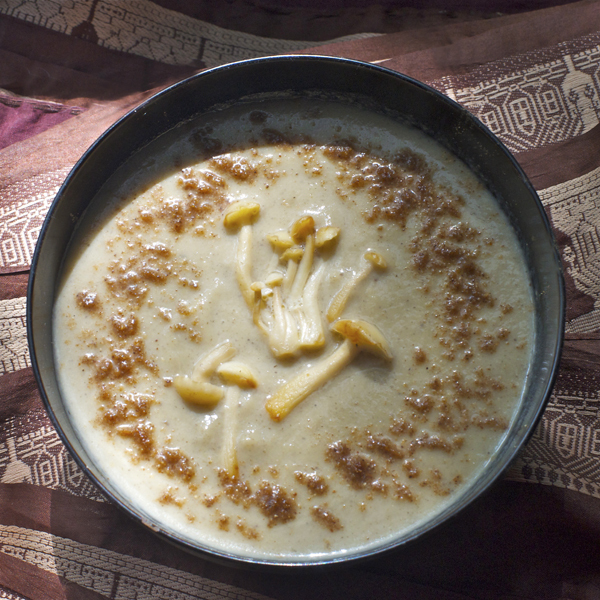 Lower the head and stir regularly until the mixture is a dark caramel color, about 30 minutes. Do not walk away. It can burn easily. Add the vegetables to the mixture and stir at medium low heat for 5-8 minutes, then add the Cajun seasoning and celery seed. Slowly add the hot stock, stirring as you add. Simmer for about 30 minutes. Add the andouille and tasso ham and cook another 5 minutes. At this point you can reserve the mixture for later or proceed (I think the base is better the next day). Salt and season the duck with 2 t Creole seasoning and sauté for a minute or 2 on each side in 1 T of duck fat and remove –– it should be very rare. Add the duck to the gumbo stock for a few minutes then add raw shrimp to the pan and cook for a minute or 2. Slice the duck and serve individually plated or on a platter with rice and chopped parsley and sliced scallions. Sprinkle with filé if you would like. **one trick is to shell the shrimp and cook the shells with the chicken stock for 20 minutes to get the flavor. Then toss the shells and you have the best of both worlds. Combine all and put in spice jar. I always complain I never win anything. Well I must stop complaining now! The brilliant site FRESH had a contest and I won. So many beautiful things from El's beloved New England suppliers. 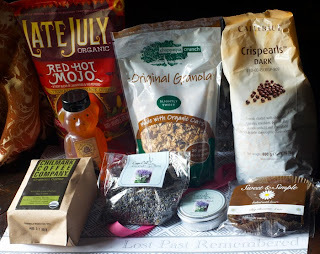 Lavender products, chips, granola, chocolate, brownies, coffee, a gift certificate from Formaggio Kitchen and gorgeous placemats from Easton Place all perfectly personalized. Do stop by El's blog HERE. You will want to be a part of her world (her photos will delight you! ).